If you have been keeping track of Moto G4 Plus news for the past few days, you would know how confused Motorola has been regarding the Oreo update for Moto G4 Plus. On September 15, Motorola released the list of smartphones that will get Oreo update. Unfortunately, and to the surprise of many, Moto G4 Plus was nowhere in the list. Now you would be wondering why should Moto G4 Plus be on the list, and why such hulla bulla around it? Well, for one, it was launched just 18 months back and secondly, the most important reason of all, the “official” infographics for Moto G4 Plus clearly mention that it will be upgraded to Android O. As they say, internet never forgets. Motorola was caught in a fix. And thankfully, they have acknowledged the infographic and issued a statement that says although Moto G4 Plus will get Oreo update, they never intended Oreo for G4 Plus, since G series gets only update and in this case, G4 Plus has received its one OS update i.e. Nougat. 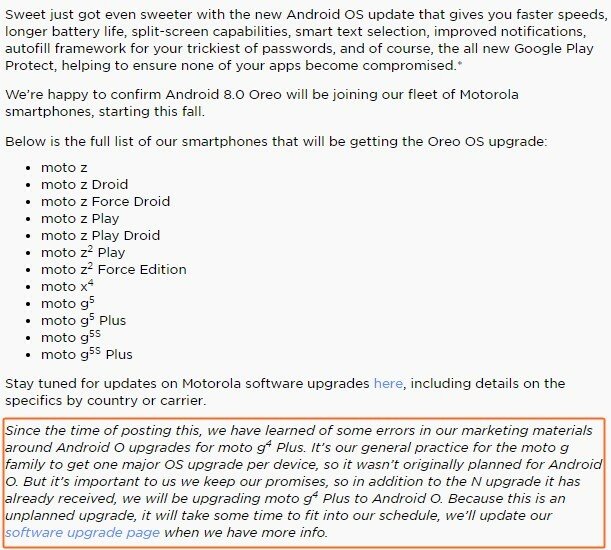 Umm, that’s a different debate all together why only one major OS update, but meanwhile, here is the official statement from Motorola. If you own Moto G4 or Moto G4 Play, sorry, but you are not getting Oreo. However, if you want to taste Oreo on Moto G4 Play or even on Moto G4 Plus (before the official release), you can install custom LineageOS ROM on your device that runs on Oreo. Also, check our full device list of LineageOS 15.0 ROM here.